Submitted Photo. 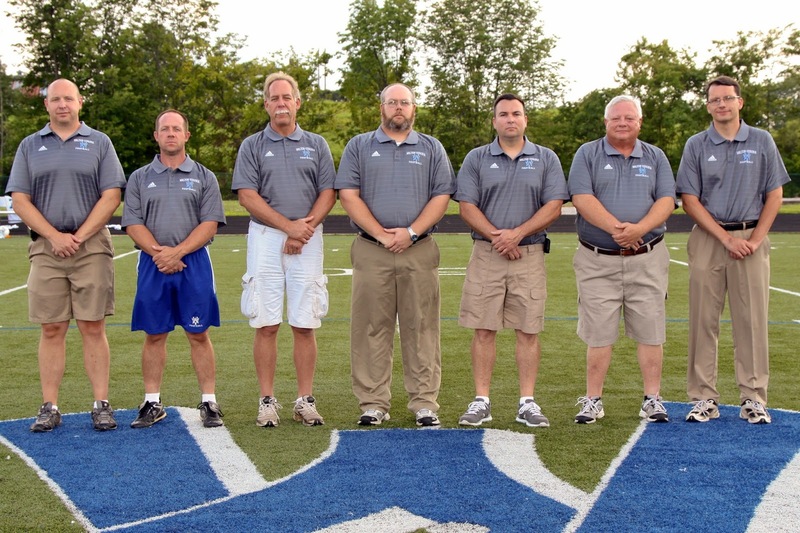 The 2013 Walton-Verona football coaching staff, from left, was Highlands 1994 graduate David Berringer, Highlands 1990 graduate Pete Valz, David French, 1995 Highlands alum and Head Coach Jeff Barth, Jeff Mosier, 1969 Highlands alum Mark Berringer and NewCath alum Brian Simmins. Like anything in life, taking over a young football program has its blessings and challenges. But 1995 Highlands graduate Jeff Barth and staff have the Walton-Verona Bearcats headed in the right direction after six seasons. The Bearcats have gone 37-21 under Barth’s guidance and are 41-27 overall. Allen Ramsey Photo. Highlands' Brennah Dutcher smacks a triple in Tuesday's win at Conner. Dutcher had four runs batted in for the Ladybirds in the huge victory. The Highlands Ladybirds softball team sought a signature win. 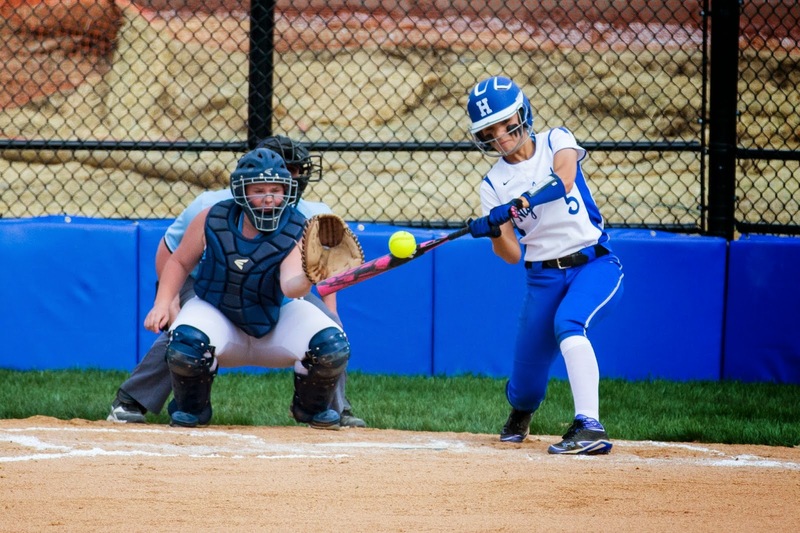 Highlands found it Tuesday with a rain-shortened 8-3 victory over the Conner Lady Cougars in Hebron. The game was called in the bottom of the sixth. The Newport Central Catholic Thoroughbreds softball team finished 2-2 in the All “A” State Tournament on Saturday and Sunday in Owensboro. The Thoroughbreds are 13-5 overall. The Highlands Bluebirds baseball team rallied for a 9th Region road win Thursday. Highlands (13-8) fell behind 4-0 after three innings. But the Bluebirds erased it in a 7-4 win over the host Lloyd Memorial Juggernauts. Allen Ramsey photo. Highlands junior Brady Murray takes a cut in Wednesday's game against Newport Central Catholic. The Bluebirds won 13-6. Allen Ramsey Photo. NewCath's Zach Pangallo (42) slides into third as Highlands' Kenny Ball (right) gets in position. SILVER GROVE – One may not have guessed it looking at the final score. But this baseball game stayed close until the seventh inning. 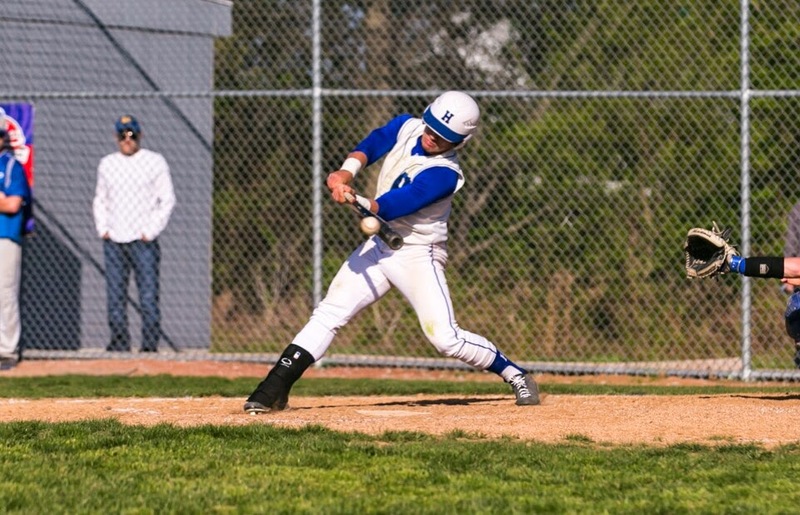 That’s when the favored Highlands Bluebirds scored five runs to put away the host Newport Central Catholic Thoroughbreds, 13-6 in the crucial 36th District contest Wednesday at Morscher Field. 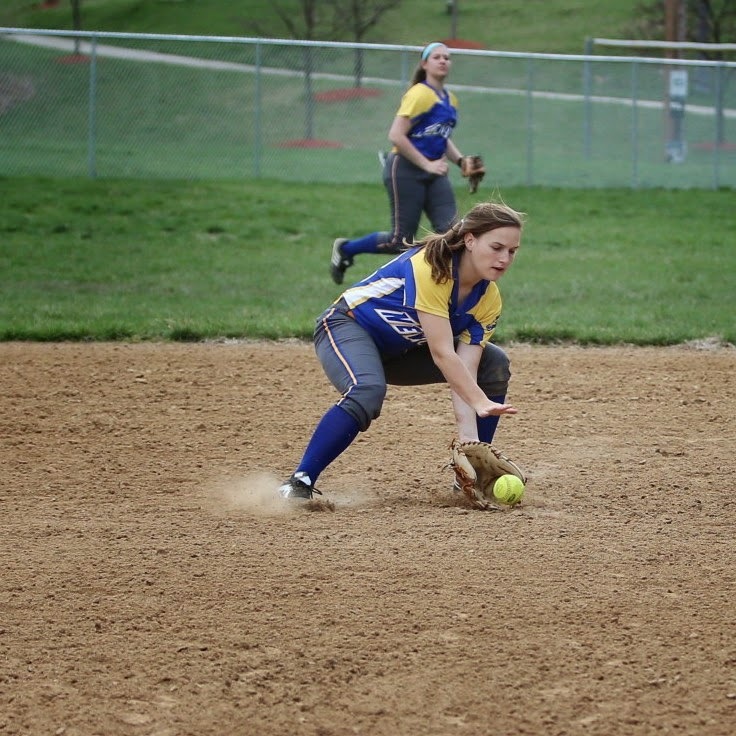 The Highlands Ladybirds softball team (9-11) snapped a seven-game losing streak with a dominating performance Wednesday. 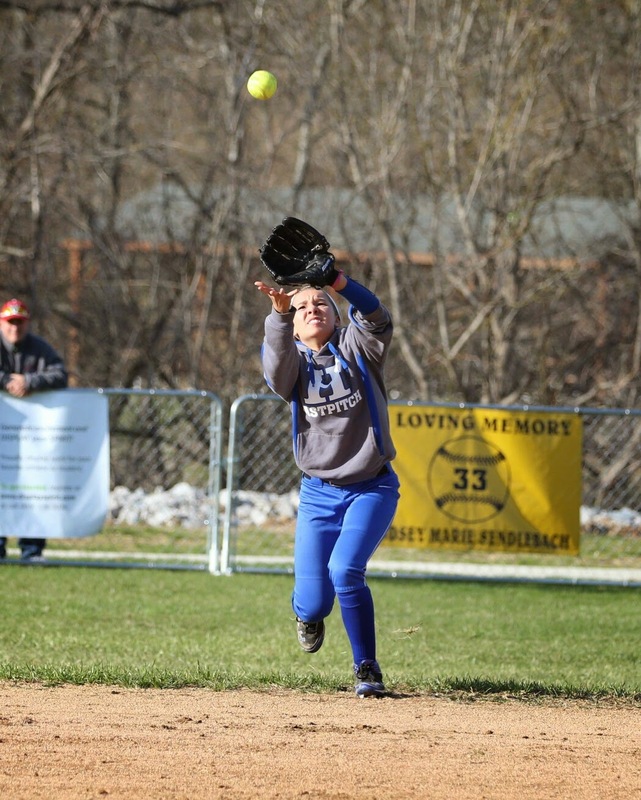 The Newport Central Catholic Thoroughbreds softball team continued to roll Tuesday. NewCath (10-3) won its seventh in a row with a 3-2 9th Region win over the Dixie Heights Lady Colonels. The Thoroughbreds outhit the Lady Colonels, 5-2 and committed just one error to three for the hosts. Contributed Photo. Recently retired Highlands football Head Coach Dale Mueller (glasses) listed spending more time with family as a big reason for his retirement. 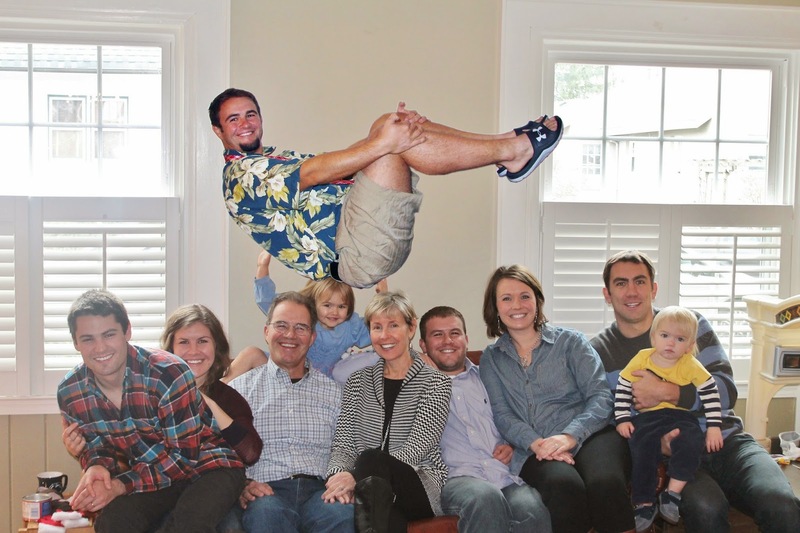 One of the big reasons Dale Mueller listed for retiring from coaching is family. 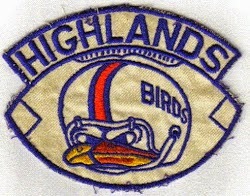 Mueller spent the last 20 seasons as Head Coach of the vaunted Highlands Bluebirds football team. The Bluebirds went 250-36 during that time with 11 state championships, three state runner-up trophies and 17 district championships. That win total is good for 18th in Kentucky High School Football history. Allen Ramsey Photo. Highlands senior Ashley Grosser (right) records the first hit for Highlands at Winkler Park on Monday. The Highlands Bluebirds baseball team snapped a three-game losing streak Monday. Highlands (11-8) shut out the visiting St. Henry Crusaders, 2-0 in a rematch of last year’s 9th Region quarterfinal contest. This marked the fourth shutout of the year for the Bluebirds. Two have come against St. Henry. The second game of the Hometown Pharmacy/Frank Shoop Invitational at Harrison County also did not go well for the Highlands Bluebirds baseball team. They tried to rally in the bottom of the seventh. But the Highlands Bluebirds came up short in the first game of the Hometown Pharmacy/Frank Shoop Invitational at Harrison County on Thursday. The East Jessamine Jaguars escaped with a 5-4 win. Both teams had eight hits and committed just one error. But the Jaguars broke a 1-1 tie with three runs in the top of the fifth. Highlands scored twice in the seventh but could not tie it. Evan Allen and Jake Whitford had two hits each for Highlands (10-7). Whitford added a run batted in with Lou Bunning and D.J. Mills hitting doubles. Highlands returns to Cynthiana on Saturday to face Lexington Tates Creek. Game time is 12:45 p.m. The Thoroughbreds fell to 7-10 with two losses Thursday. The Colonels outhit the Thoroughbreds, 13-7. Nate Enslen led NewCath going 3-for-3 with a run batted in and stole a base. The Mustangs outhit the Thoroughbreds, 11-6. Enslen had a two-run single and Zack Pangallo had a triple for NewCath. NewCath led 3-2 entering the seventh inning. But Bishop Brossart scored four runs to win the game. NewCath does not play again until Monday. The Thoroughbreds travel to Bellevue for a 5 p.m. contest. Allen Ramsey Photo. Highlands first baseman Brennah Dutcher (left) makes a play in Wednesday's loss to Notre Dame. The Ladybirds are 8-7 on the year. 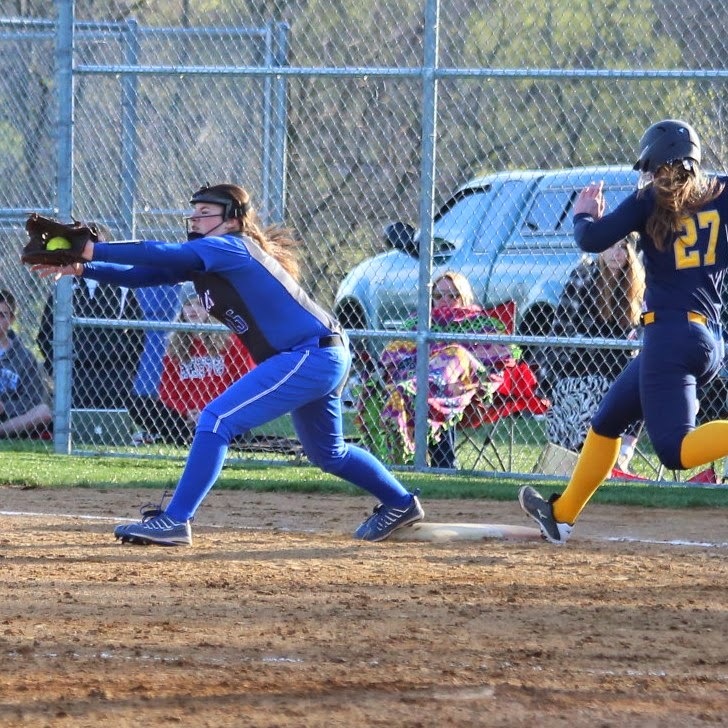 The Newport Central Catholic Thoroughbreds softball team used another Haley Meyers no-hitter to win its fifth in a row Wednesday. 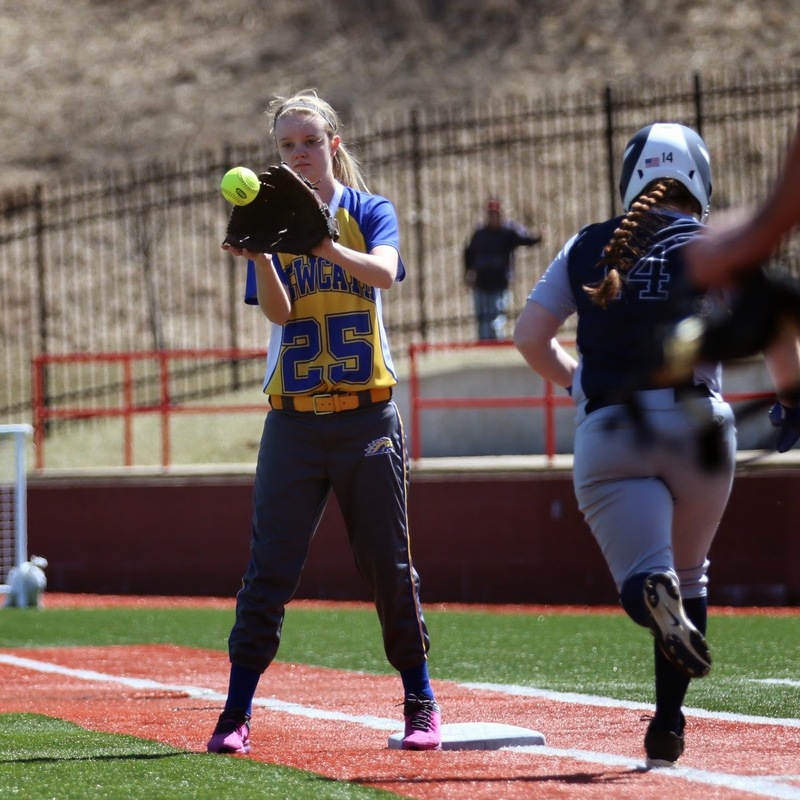 Meyers’ second one of the season lifted NewCath to an 11-0 five-inning stomping of the visiting Covington Holy Cross Lady Indians. Meyers struck out five, walked three and hit a batter. NewCath (8-3) also took advantage of seven Lady Indian errors scoring seven times in the fifth to end the game. NewCath managed just four hits. Three of those hits came in the fifth. Kristen Schreiber hit an RBI double off the fence in left-center and Taylor Burkart singled to center before Molly Mertle ended the game with a two-run double to left. Casey Kohls recorded NewCath’s other hit in the fourth. NewCath does not play again until Monday. The Thoroughbreds play host to Bellevue at 5 p.m. The Ladybirds (8-7) dropped their third in a row Wednesday. Highlands committed four errors to two for Notre Dame. The Pandas outhit the Ladybirds, 5-2. Notre Dame scored four runs in the first inning and never looked back. Highlands scored five times in the fourth. Brennah Dutcher and Shelby Graybill had both Highlands hits. Dutcher singled in two and Graybill one. Bailey Spencer took the pitching loss for Highlands. She struck out five and walked four. Highlands travels to Milford (Ohio) on Friday. The Bluebirds (10-6) lost in eight innings to the host Colonels. Jake Whitford again led Highlands at the plate. He went 3-for-4 with a run scored. Todd Ramey batted in two with a double. Errors hurt the Bluebirds down the stretch. They committed six to one for Dixie Heights. Highlands ventures south to play East Jessamine at Harrison County on Thursday. Game time is 7:30 p.m. The Thoroughbreds (7-8) dropped a 9th Region home contest Wednesday. The Crusaders scored twice in the top of the seventh to earn the win. They outhit the Thoroughbreds, 10-8. Spencer Pangallo and Mitch Pangallo led NewCath with two hits each. The both scored one run each and Mitch Pangallo batted home one. NewCath plays twice Thursday. The Thoroughbreds play Covington Catholic at 10:30 a.m. before facing Bishop Brossart at 1 p.m.
G. Michael Graham Photo. The Highlands Bluebirds could be in the same Class 5A district with Dixie Heights, Covington Catholic and Grant County starting in 2015. The Kentucky High School Athletic Association recently released the draft football alignments for the 2015 through 2018 seasons. 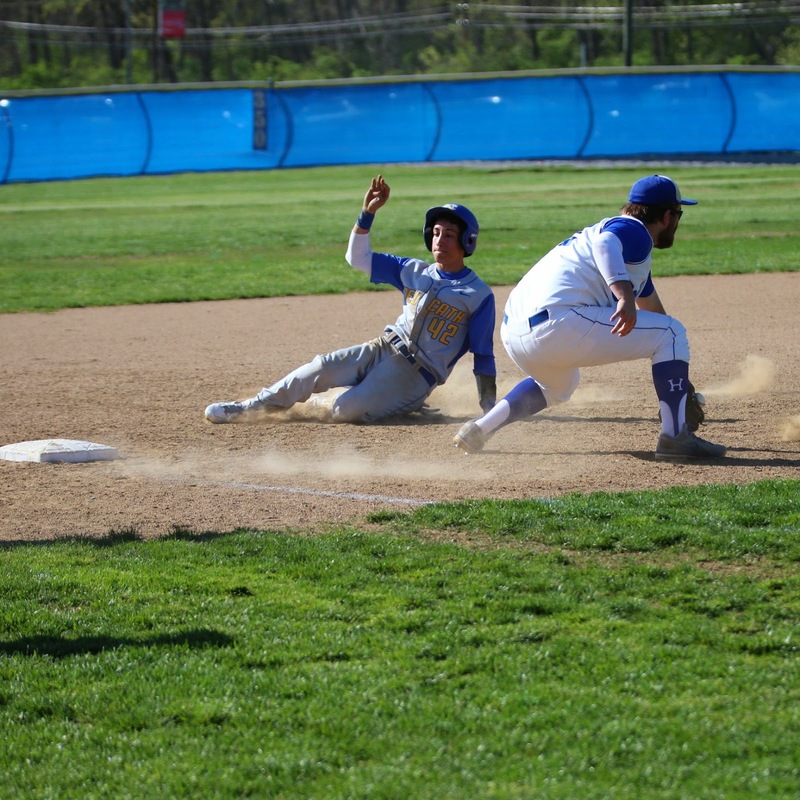 The Highlands Bluebirds baseball team defeated another Greater Catholic League opponent on Saturday. Highlands (10-5) ventured across the Ohio River and knocked off Cincinnati McNicholas, 1-0. Lou Bunning and Jacob Noe combined to pick up the pitching win for the Bluebirds allowing just three hits. Bunning pitched five innings and walked none before Noe came in and picked up the two-inning save. Jake Whitford finished 2-for-3 with the game’s only run batted in. He singled home Brady Murray in the top of the sixth on the ninth pitch of the at-bat. The Thoroughbreds moved back to .500 at 7-7 with the Saturday win in the Doc Morris Invitational at Covington Holy Cross. The Thoroughbreds outhit the Vikings, 11-8 and scored seven runs in the first inning on their way to the win. Nate Enslen, Grant Moeves and Mitch Pangallo led the way with two hits each. Moeves had four runs batted in with a double and Mitch Pangallo tripling and batting in two. Jake Pangallo scored three times and Enslen twice. Jake Yeager picked up the win throwing five innings. He struck out five and walked two. The Ladybirds fell to 8-6 following two losses Saturday in the Jaguar Classic at East Jessamine. In the first game against the hosts, Shelby Graybill led the way going 2-for-2. Whitney Quillen and Brooke Dill scored two runs each. Highlands had several starters at Prom in the second game allowing younger players to earn some experience. Ryle outhit Highlands, 12-4. Allen Ramsey Photo. Newport Central Catholic junior Casey Kohls fields a ground ball in Friday's All "A" 9th Region semifinal win over Lloyd Memorial. The Thoroughbreds won the tournament for the first time since 2011. They were not going to be denied this year. The Newport Central Catholic Thoroughbreds softball team (7-3) claimed its first All “A” 9th Region crown since 2011. The Thoroughbreds beat St. Henry, 8-2 in the title game and run-ruled Lloyd Memorial, 10-0 in five innings in the semifinals. The Highlands Bluebirds baseball team led 6-4 going into the top of the seventh. But the visiting Cooper Jaguars scored six in the top of the inning to leave Fort Thomas with a 10-6 victory Thursday. Highlands fell to 8-5 with the 9th Region loss. Allen Ramsey Photo. Highlands senior Ashley Grosser makes a catch in Wednesday's 4-3 win over Bishop Brossart. Highlands moved to 7-4 with the win. The Highlands Bluebirds baseball team dominated its 9th Region contest Wednesday. Highlands (8-4) handled the Covington Holy Cross Indians, 10-0 in five innings at Northern Kentucky University. The game took place as part of the Reds Futures Showcase. G. Michael Graham Photo. Highlands Head Coach Brian Weinrich (right) gives instructions during a recent spring practice. The Bluebirds just concluded 10 days of spring ball. Aside from the usual transition, not much changed in spring practice for the Blue and White. The only noticeable change was the absence of the retired 20-year veteran Head Coach Dale Mueller. Mueller retired after last year that saw Highlands go 13-2 and finish Class 4A runner-up to Collins. The Bluebirds went 250-36 during Mueller’s tenure, won 11 state championships and finished runner-up three times. Haley Meyers fired her second career no-hitter to lead the Newport Central Catholic Thoroughbreds softball team in the first round of the All “A” 9th Region Classic on Monday at Beechwood. The Newport Central Catholic Thoroughbreds baseball team advanced in the All “A” 9th Region Tournament on Saturday. Things started off well for the Highlands Bluebirds baseball team Thursday. But they did not stay that way as the Ashland Tomcats rallied for a 10-6 victory in the Cal Ripken Experience at Myrtle Beach (S.C.). The Bluebirds fell to 6-3 with the loss. G. Michael Graham Photo. Beau Hoge (left) and Austin Hergott (right) stand next in line as quarterbacks of the deeply talented Highlands Bluebirds football team. It’s the football position that garners a lot of attention, especially in a balanced offense. The Highlands Bluebirds lost for the first time on the road trip. Glenbard South (Illinois) downed Highlands, 6-1. The Bluebirds dropped to 6-2 on the season. Highlands returns to action at the Cal Ripken Experience in Myrtle Beach at Noon. The Bluebirds take on Ashland at Noon. The Newport Central Catholic softball game against Boone County and baseball game against Newport were both rained out Wednesday. The baseball team begins the All “A” 9th Region Tournament against Bellevue at 5 p.m. Thursday. The softball team travels to Harrison County at 4:30 p.m. Thursday. Allen Ramsey Photo. Newport Central Catholic junior Sarah Neace (25) records an out in Tuesday's game against Louisville Presentation. Neace went 3-for-3 with two walks in the loss for the Thoroughbreds. It turned into their second win in two days in the Palmetto State. But this one was more convincing.